ReSharper 6 RC has been released. KAlarm 2.7.0 has been released. You can set up alarm messages which pop up on the screen at the chosen time (with sound if desired), or you can schedule commands to be executed or emails to be sent. For alarm messages, choose whether to type in your own text message, display the text generated by a command, or display a text or image file. Configure the alarm to recur on hours/minutes, daily, weekly, monthly or annual basis, or set it to trigger every time you log in. You can also specify a repetition within a repetition. Alarms can be constrained to occur only within working hours, or excluding holidays. Specify that a reminder should be displayed in advance of the main alarm time(s). Choose a color and font for displaying the alarm message. Specify an <menuchoie>audible beep</menuchoice> or a </menuchoice>sound file</menuchoice> to play when the message is displayed, or specify that the message is to be spoken. Choose whether or not the alarm should be cancelled if it can’t be triggered at its scheduled time. An alarm can only be triggered while you are logged in and running a graphical environment. If you choose not to cancel the alarm if it can’t be triggered at the correct time, it will be triggered when you eventually log in. 1. adds a new option for reminders after the main alarm. 2. Another new option will wake the system from suspend when an alarm triggers. 3. A new command line option can disable alarm monitoring at startup. 4. The display of left hand buttons in time spinboxes in Oxygen style has been fixed. 5. It includes other bugfixes and a new Bosnian translation. The YUI team has just completed the second sprint of the 3.4.0 development cycle. We’ve posted the results of the sprint to the CDN for community exploration and feedback. You can access this release at http://yui.yahooapis.com/3.4.0pr2/build/yui/yui-min.js. There have been some changes to Loader to support flattening the organization of dependencies in the library. In addition, the allowRollup config is now false by default. You’ll need to pay close attention to your dependencies when working with this new configuration as the includes are more fine-grained to allow for smaller total downloads. There may be instances where additional files had been downloaded in the past as part of rollups that are no longer included with the revised Loader, so you may need to include more modules in your code’s use() call. If you’re doing manual load specifications via use("*") or make use of submodule configurations, please try your code with the updated Loader to be sure we’re correctly handling your use case. The new Calendar component is now included in the build. This is a very early release consisting of Calendar’s core functionality. Skinning and additional features will continue to be added ahead of the 3.4.0 launch. The App Framework, YUI’s new suite of MVC infrastructure components, is fully functional and ready for use. Two new widget-level plugins allow widgets to be modal and hide on certain user interactions. WidgetPositionAlign syncs on scroll and window-resize. You will also find updates to the Graphics API, performance enhancements in Base, bug fixes in Dial, and many more additions throughout the library. Thunderbird 5.0 Beta 2 has been released. Thunderbird Beta is a preview release for the next major version of Thunderbird. It is being made available for testing purposes only. Please read the release notes before downloading. Mozilla Messaging provides Thunderbird Beta for Windows, Linux, and Mac OS X in English only for Alpha releases. Beta and release versions will be made available in more languages. Scientific Linux 6.1 Alpha 2 has been released. The second alpha release for Scientific Linux 6.1 has been released. Alpha stage and not Beta stage. - Added the svg files into the source tar ball. - Fix a security issue with the tmp configuration files. - We got it to compile. - Added. This is for x86_64 only. - Passes our tests now. Update 1. We downgraded it to the version they released with. - gfs-pcmk and ldm-pcmk were removed. - Updated to reflect changes associated with Update 1. Packages that built but we’re still testing for one reason or another. automatically selected on desktop installs. Hibernate Core 4.0.0.Beta2 has been released. The release is available from SourceForge in bundle form as well as from the JBoss Nexus repository under the org.hibernate groupId. jBPM 5.1.0 has been released. jBPM5 is the latest community version of the jBPM project. It is based on the BPMN 2.0 specification and supports the entire life cycle of the business process (from authoring through execution to monitoring and management). Drools 5.2 has been released. Drools 5 introduces the Business Logic integration Platform which provides a unified and integrated platform for Rules, Workflow and Event Processing. It’s been designed from the ground up so that each aspect is a first class citizen, with no compromises. MVELThe MVEL dialect has been improved. All variable lookups have been moved to new indexed factories, which should allow faster execution, as well as being simpler code. The build process for MVEL has been reviewed to streamline it to avoid wasteless object creation so that the build time is faster. The ParserConfiguration is now shared which will make each MVEL compilation unit faster to initalise. Configurable type-safety has also been added. ClassloaderThe Classloader has been improved to use a CompositeClassLoader instead of the previous hierarchical “parent” classloader to better support use of Drools within OSGi containers. Lazy Truth MaintenanceYou no longer need to enable or disable truth maintenance, via the kbase configuration. It is now handled automatically and turned on only when needed. Multi-function AccumulatesThe accumulate CE now supports multiple functions. Parameterized constructors for declared typesGenerate constructors with parameters for declared types. Type Declaration ‘extends’Type declarations now support ‘extends’ keyword for inheritance. Free Form expressions in Constraints (New Parser)The parser has been rewritten. We had reached the limitations of what we could achieve in pure ANTLR and moved to a hybrid parser, that adds flexibility to the language. The main benefit with the new parser is that the language now supports free form expressions for constraints and ‘from’ statements. Rule APIA fluent API was created to allow programmatic creation of rules as an alternative to the previously suggested method of template creation. Positional ArgumentsPatterns now support positional arguments on type declarations. Backward ChainingDrools now provides Prolog style derivation queries, as an experimental feature. Non Typesafe ClassesAnnotation @typesafe( ) has been added to type declarations allowing for the configuration of type-safe evaluation of constraints. Session ReportsAn experimental framework to inspect a session and generate a report, either based on a predefined template or with a user created template, has been added. Improved Camel integrationCamel integration using the Drools EndPoint was improved with the creation of both DroolsConsumer and DroolsProducer components. Guvnor Look & Feel; moving closer to native GWTWe have removed GWT-Ext from Guvnor and now only use GWT. Embed Guvnor EditorsWe have added the ability to embed Guvnor Editor’s in external applications. Annotations come to Declarative ModelsThe ability to add annotations in Guvnor to declarative models has been added. Support for Complex Event Processing in the guided editorsThe guided editors have been enhanced to allow full use of Drools Fusion’s Complex Event Processing operators, sliding windows and entry-points. New guided decision tableThe existing Guided Decision Table has been replaced to provide a foundation on which to build our future guided Decision Table toolset. The initial release largely provides an equivalent feature-set to the obsolete Guided Decision Table with a few improvements, as listed below. Enhanced Package’s ReportTemplates Rules and Decision Tables rules are now included in the package’s report. Spring Context EditorNow it is possible to create and mange Spring Context files inside Guvnor. Configuring Multiple Guvnor Instances In a JackrabbitWe added a new task in drools-ant which helps with configuring multiple Guvnor instances to be able to share their Jackrabbit content. Configuring Guvnor to use an external RDBMS made easierWe added a new section under the “Administration” tab called “Repository Configuration” which helps generate the repository.xml configuration file for a number of databases. Removal of BRL Guided EditorThe BRL Guided Editor has been removed due to lack of interest and it falling behind. Spring Social 1.0.0.RC1 has been released. Spring Social is an extension of the Spring Framework that allows you to connect your applications with Software-as-a-Service (SaaS) providers such as Facebook and Twitter. An extensible service provider framework that greatly simplifies the process of connecting local user accounts to hosted provider accounts. A connect controller that handles the authorization flow between your Java/Spring web application, a service provider, and your users. Java bindings to popular service provider APIs such as Facebook, Twitter, LinkedIn, TripIt, GitHub, and Gowalla. Sign-in controllers that enable users to authenticate with your application by signing using Facebook or Twitter. Additions to the Facebook API binding such as photo and video upload, Facebook page support, and Facebook search. Expansion of the Twitter API binding to include mobile notifications, blocking, and geo location operations. Implicit sign up support enabling automatic sign up of a user from a connection. A new quickstart showing how to get up and running quickly. Numerous bug fixes and other improvements based on user feedback (see the changelog for details). uTorrent 3.0 has been released. 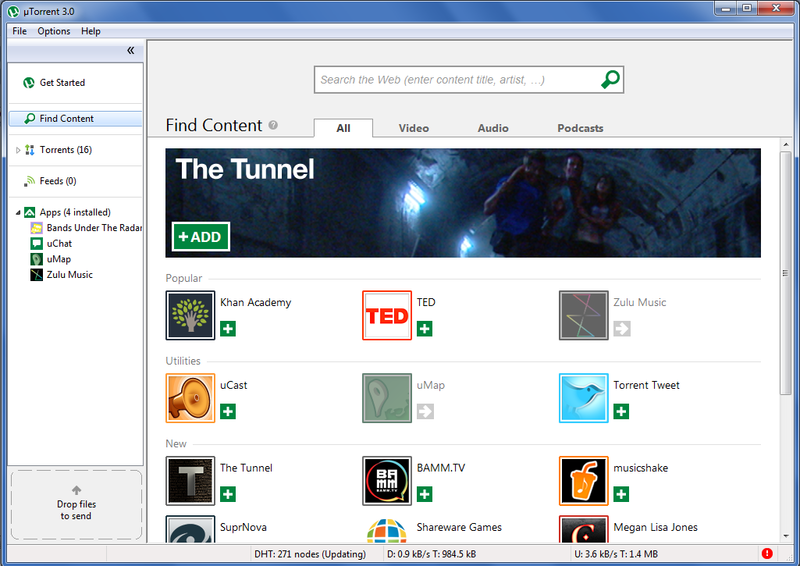 What’s new in µTorrent 3.0? Watch videos within seconds with our progressive downloads – no need to wait for the entire file to download. This feature is especially great for previewing a file before committing to the full download. To use this feature, simply click the streaming button when it appears in the Playback column within the Torrents tab. Requirements: Your video player must support streaming, and not all file types are stream-able by all players. Start, stop, and monitor torrent downloads on the go. Access your client from any Web browser (go to remote.utorrent.com or hit the remote icon in the µTorrent toolbar to sign up). Or, download the beta of our Android app. Ratings enables the collective wisdom of the community to ensure the quality and security of downloaded torrents. Join in and contribute by simply clicking on the ratings or comment buttons in your torrent manager. Easily send massive personal files – e.g. home movies, cell phone videos and hi-res photos –directly from µTorrent. Select a file on your computer, drag it into the µTorrent “Drop files to send” box and µTorrent will create a Web link. When you share this link with others through things like e-mail or social media post, you share your personal files. Keep your client simple by minimizing parts of the µT interface with a click. Perfect for anybody who wants a minimal interface, this feature cuts out distractions and lets you focus on the business of finding, getting and playing content. Load µTorrent on a USB stick and take it wherever you go, without leaving files behind! Simply run the new µTorrent from a USB stick, choose portable mode during install, and µTorrent will automatically store your settings and content on the USB stick – even if the computer you’re using already has µTorrent installed. No muss, no fuss. µTorrent 3.0 also offers under-the-hood improvements including a focus on stability as well as improved Web seeding to add speed and reliability to the process of finding the original source of a single-source file. µChat! Download it now. We can’t wait to hear what you think of this one. Plus, check out some of our recent artist spotlights. The spooky horror film The Tunnel (IMdb) has been a huge hit, as has Sick of Sarah’s 2205 album. Both of these, and more, are available in the App Studio free with the endorsement of the creators. Please join us and support progressive artists who support BitTorrent.